Establish a national scholarship foundation for foreign students. 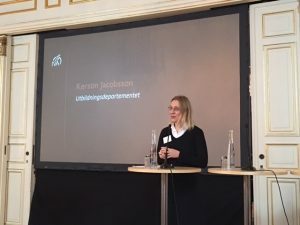 Senior Project Manager Martin Wikström presented the report and Deputy Director-General Kerstin Jacobsson from the Ministry of Education and Research commented on the presentation. To begin with she mostly talked about the Research Bill that was presented last Monday, but after that she focused on internationalisation. Jacobsson summarised impressions and questions that came up at the hearings the Ministry organised in autumn 2015 – mobility, tuition fees, promotion of Sweden, migration, whether or not we need an internationalisation strategy. An inquiry on internationalisation is planned, and Jacobsson stated clearly that it will include both education and research. And she welcomed the report as a constructive contribution to the work ahead. I was particularly pleased to hear that points 4 and 6 will be addressed in a fast-track process. Although we welcome the inquiry, it will take a long time and some issues are ripe for tackling immediately. So it was pleasing to hear that the issues of legal obstacles and scholarships will be addressed more quickly. 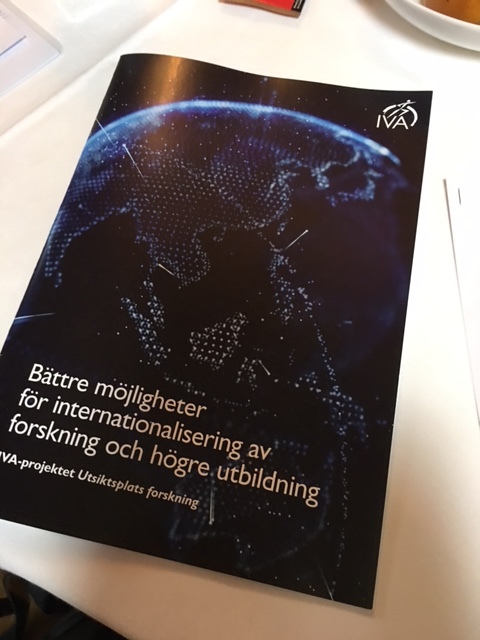 I participated in the panel that discussed the report on Thursday morning, as a member of Research Outlook’s steering group.